"Mav, do you remember the number of that truck driving school that was on TV the other night, Truck America or something like that?" 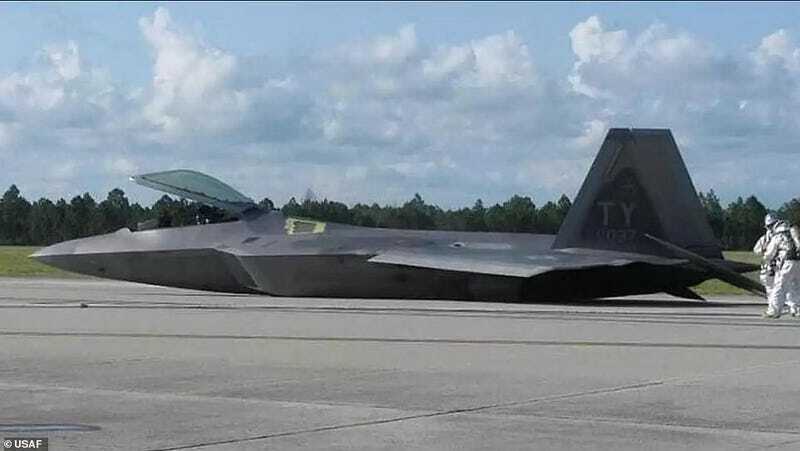 An Air Force rookie pilot crashed a $140million F-22 stealth fighter jet on the runway right after takeoff because they took off too slowly and pulled the nose up too early, an investigation has revealed. The student, using the callsign ‘Topgun 65', was preparing for a training flight to perform BFM (Basic Fighter Maneuvers) against an F-18 Hornet when the aircraft ended up belly-up at the Naval Air Station Fallon, Nevada, on April 13, 2018. The F-22 took off going 23 knots below the recommended speed, which was fast enough to leave the ground but too slow to keep the plane in the air. The crash prompted a retraining of all pilots using the aircraft to prevent more blunders in the future. The report found that early rotation was not only common to the pilot involved in the crash, but also to multiple TOPGUN students. The aircraft then slid 6514 feet on its underside before coming to rest 9,419 feet from the runway threshold, after which the pilot safely emerged from the plane. *facepalm* Good job Mav. The article mentions that the pilots were retrained on proper take off procedure, but I really hope people were drummed out over this. There's brash, and then there's just stupid.